Berlin in the days and months and even years after the fall of the Third Reich is a huge topic. Rather than try to tackle every aspect, here is an overview. 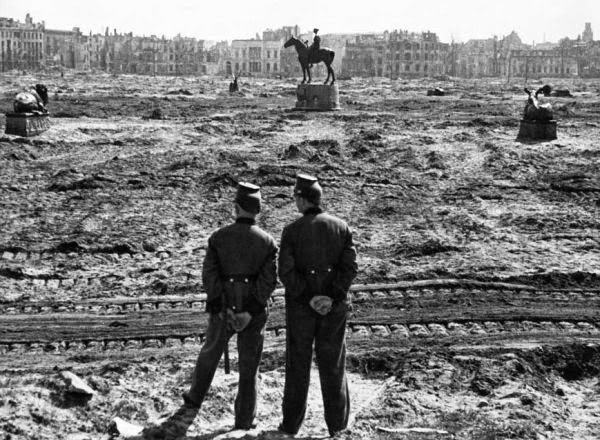 Berlin was functioning right through the ground battle for the city. The subways still ran, the streetcars were still in service. 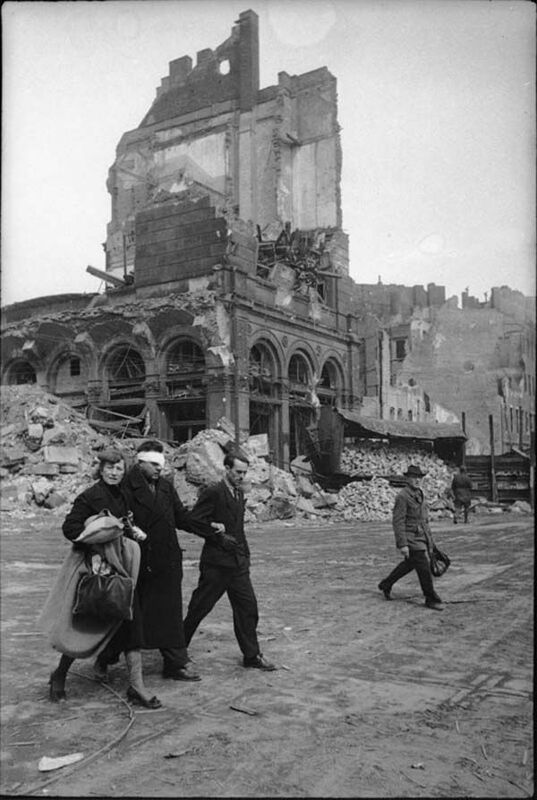 However, the city was completely destroyed. The thing to remember is that much of the destruction took place in the final weeks. 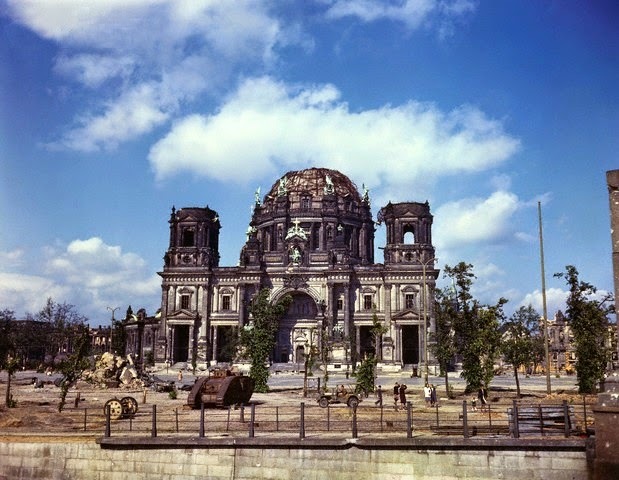 Until 22 November 1943, in fact, Berlin was largely (no, not entirely) untouched by the war. That winter, however, the British resumed the bombing of Berlin that it had suspended in 1941. Residents remember that as the start of the 'end,' before then, life had proceeded reasonably normally with parties and outings to the park and fairly modest destruction. 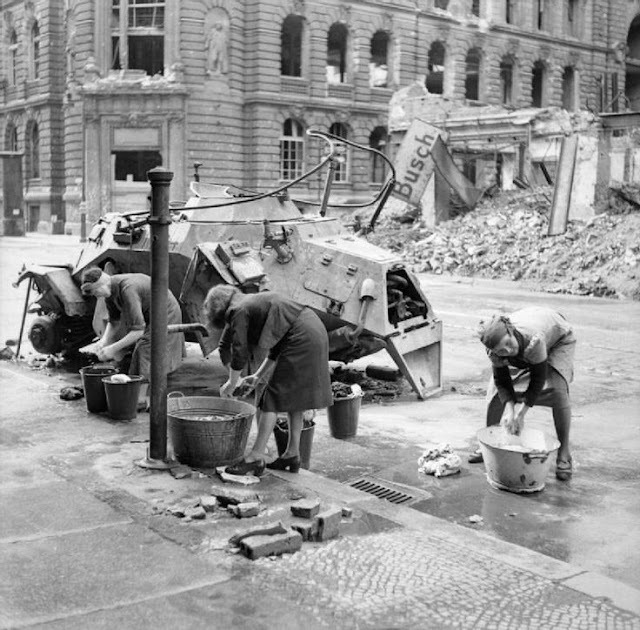 German women doing their washing at a cold water hydrant in a Berlin street. A knocked-out German scout car stands beside them, 3 July 1945. Massive Allied bombing in 1945, with the Luftwaffe virtually grounded through lack of fuel, and Soviet artillery firing at point-blank range finished the job. 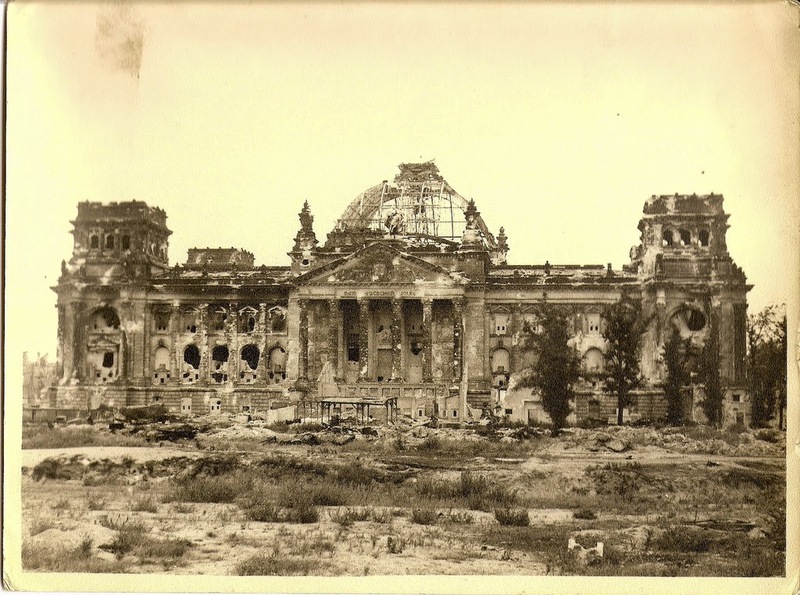 Pictures of the Reichstag are a tiny bit misleading, because it had been burnt down before the war. However, it is representative of what happened to the city as a whole. Berlin looks great today. There certainly are memorials, and you can most definitely see reminders of the war here and there. 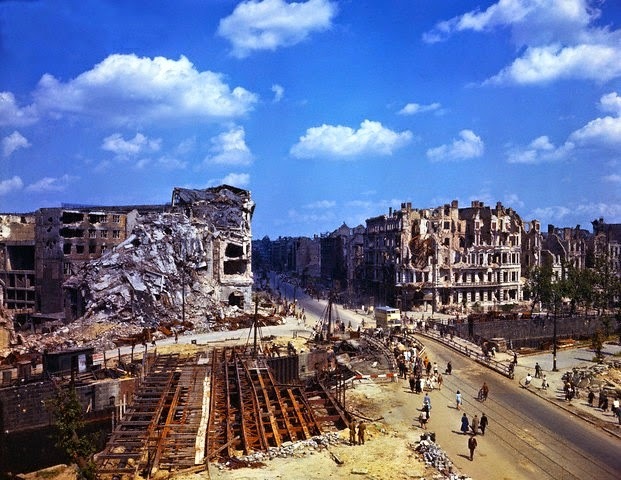 For the most part, however, Berlin is completely rebuilt. 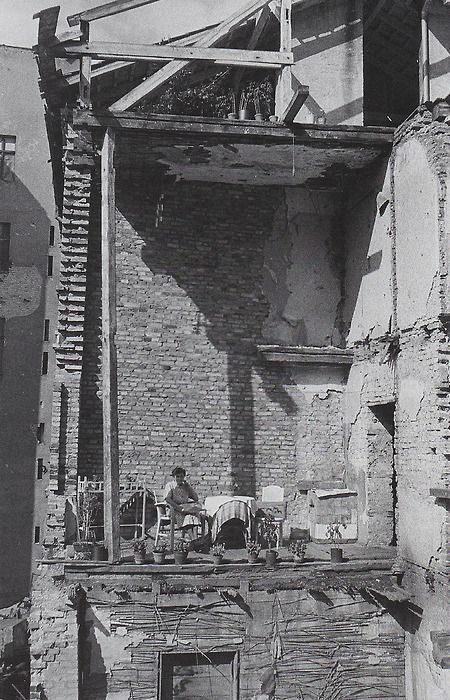 It is easy to imagine, though, that the post-war buildings do not convey the charm of the pre-war city. 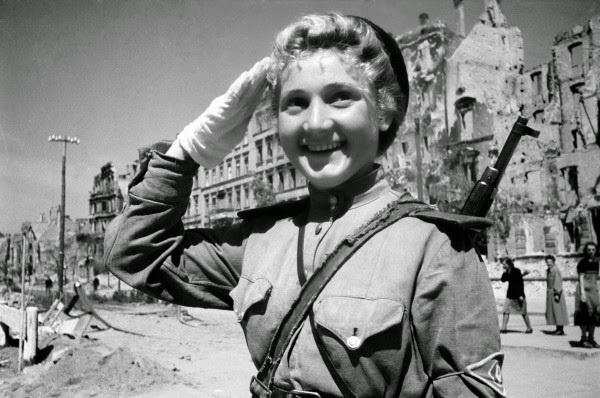 The Soviet troops took over all governmental functions by July 1945. 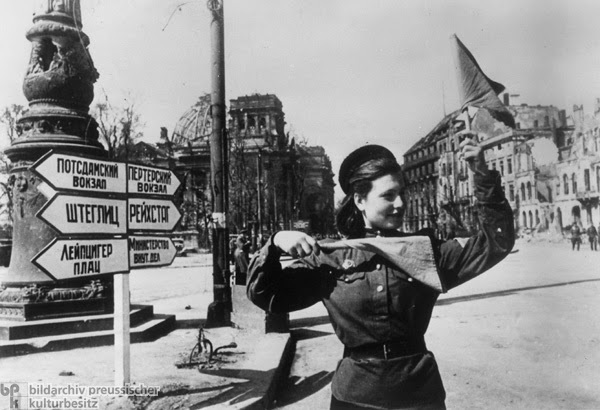 That included female Soviet soldiers directing traffic and so forth. Stalin had agreed to divide Berlin with the United States, Great Britain and France in exchange for concessions elsewhere, a decision he later bitterly regretted and tried to nullify. However, eventually the western powers took over their sections and the division of Berlin into east and west began. 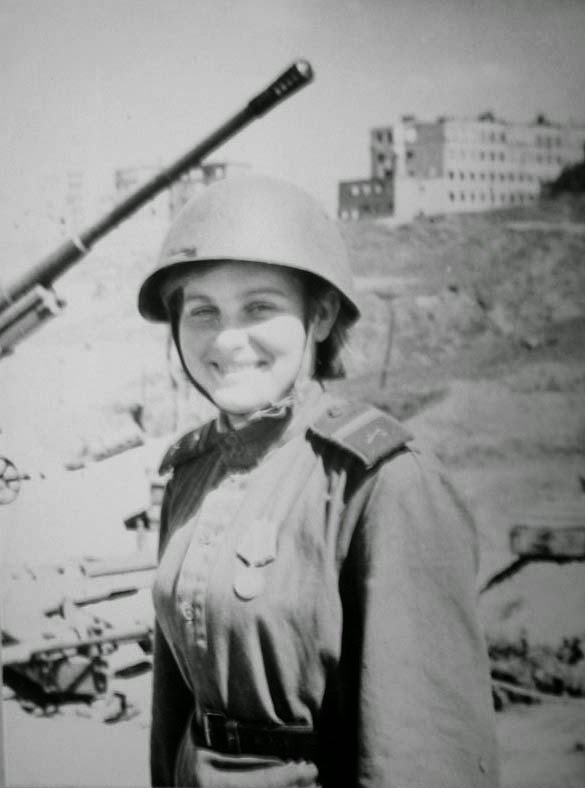 Many Soviet women were highly decorated, including some who became Heroes of the Soviet Union, the top award. Those who received it were granted a lifetime pension, and a bust of them was placed somewhere in their hometown. Usually, a soldier had to risk their life repeatedly or comply with an order to "take this or that place fast" in order to achieve it. Where there are young men and single women, there will be fraternization. Officially, it was forbidden. Before you say, "How horrible, just let them have some fun," it wasn't always so innocent. One of the American jailers at Spandau Prison later related a story of how he was seduced by a German girl who convinced him to smuggle some "medicine" to Hermann Goering. A few weeks later, nobody could figure out where the condemned Reichsmarschal obtained the poison with which he committed suicide. So, it went on despite the rules and occasional punishment even under the strictest security. Call it "friendly chatting." In the two years following the end of the war, GI applications for marrying German women increased manifold. That's a whole lot of chatting. American GIs talk with young German ladies in Berlin's Tiergarden in August 1945. 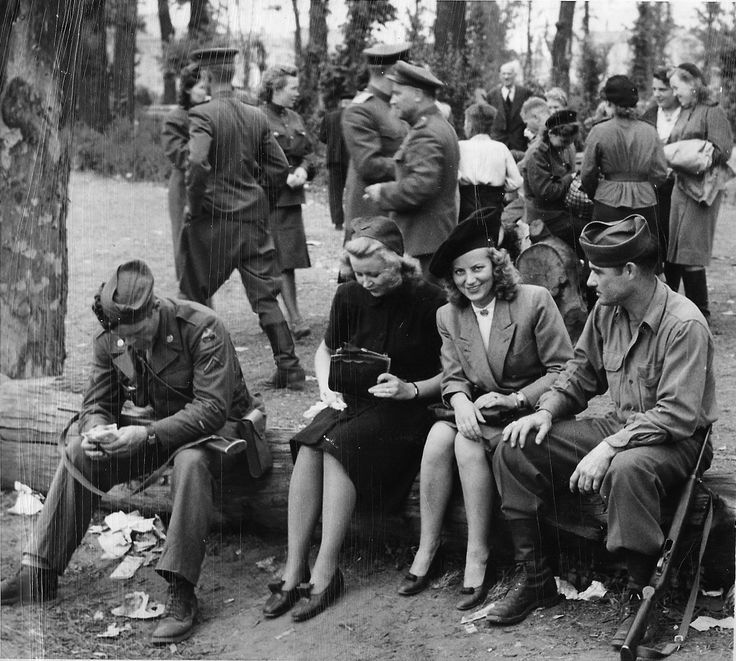 A group of Soviet soldiers is in the background, also with some frauleins. Not everybody was thrilled by what was going on. Some unidentified boys give the cameraman the "look" in a street scene, below. it does not take much imagination to conjure up what they had probably been through a few months before, and what the fate of their fathers had been. These boys look a little out of place in street clothes. 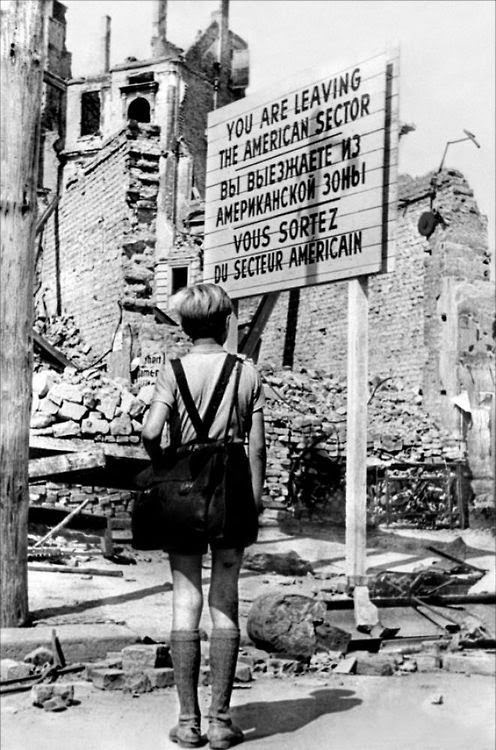 Berlin, of course, was set up into occupation zones controlled by the Americans, British, Soviets and French. This was agreed to long before the city was captured, and Stalin agreed to it due to a transfer of territory elsewhere in exchange for turning over this valuable property to the western Allies. A common scene after the war - "Who Knows Him?" 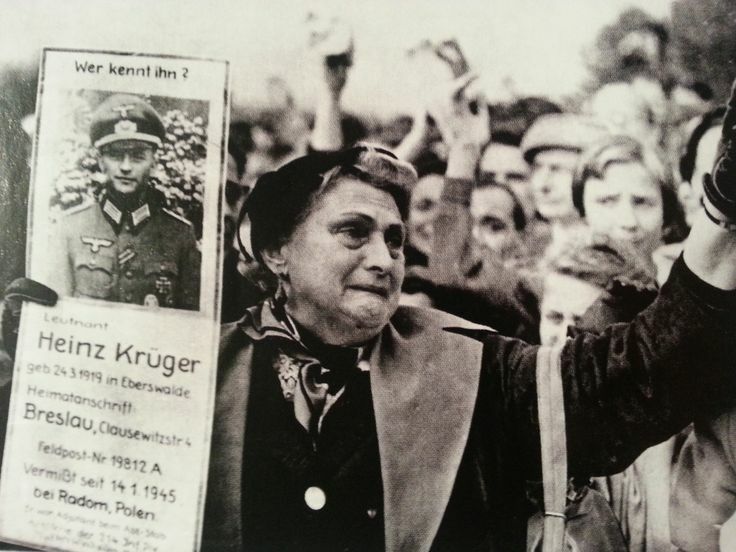 Herr Kruger apparently was last seen in Poland as the Soviets swept around his position. Stalin held all the cards. He had a million men on the Oder River line before the US was even across the Rhine. This was the biggest reason why Eisenhower never, at any point, pinpointed Berlin as a major target of American and British forces - he never had the slightest chance of taking it anyway. Stalin wanted it, and Stalin got it. 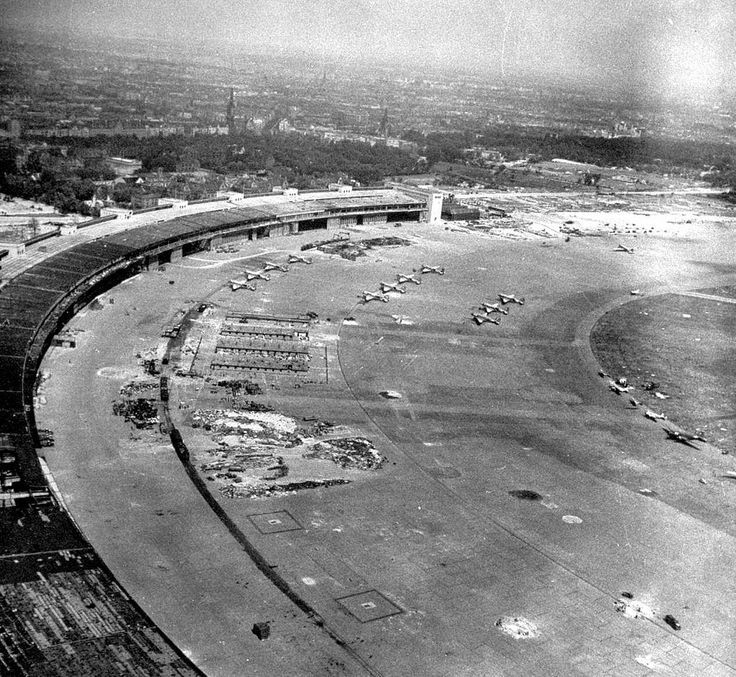 Aerial view of Tempelhof Airport after the fall of the capital. 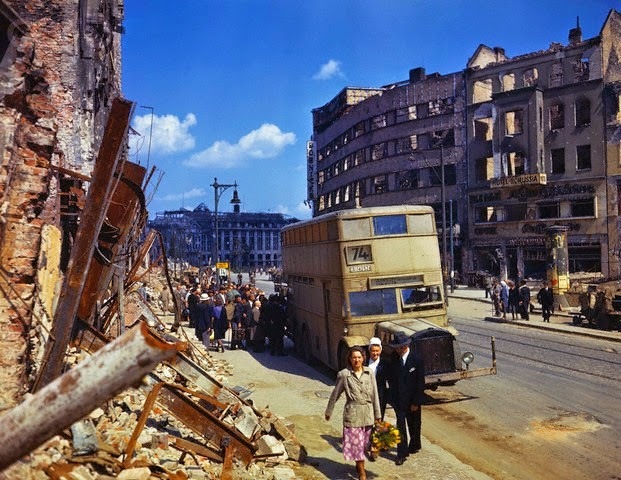 It became the terminus of the Berlin Airlift after the war. The sectors at first were wide open to people crossing between them, but Stalin later changed his mind about the Allied presence. He tried to force the western Allies out by blockading all land routes to Berlin (he controlled all of the territory surrounding the city). Pictures of the aftermath usually don't include shots of the wounded, but this nicely captures the reality of what the war did to those who survived. 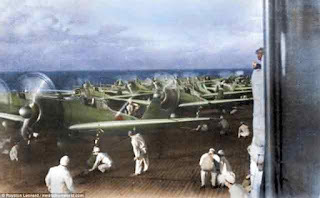 Through the Berlin Airlift, the Americans and others managed to remain. Stalin, though, began to notice that people were leaving his zone and walking over to the American, French and British zones. But the solution to that would come much later. This boy has good posture - the posture of a former soldier. 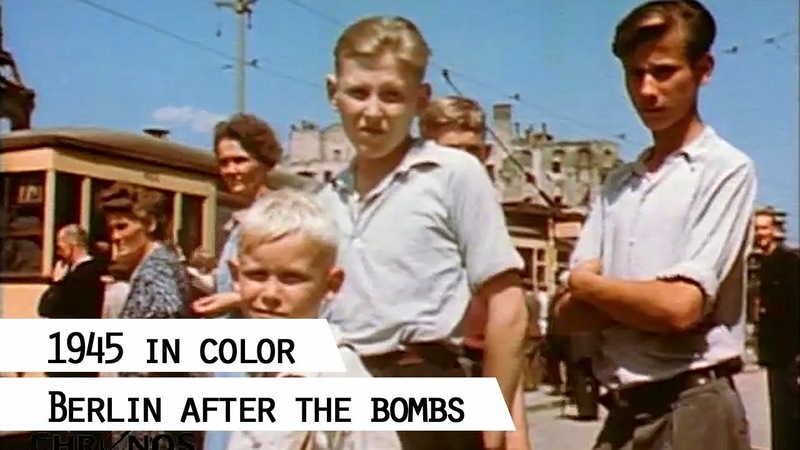 Below is the best video I have ever seen - and I have seen a few - of Berlin right after the fall of the Third Reich. It is nicely in color, and gives various perspectives. A street mannequin catches the attention of the MPs. One can only imagine the thoughts of the common people, reduced to penury, as they reflected upon the recent Hitler regime. Above, a shop mannequin is placed in a (highly illegal) posture on a dirty public street, no doubt as a bit of a joke. The MPs are there to take it down, first taking a picture of this sign of "subversion" for the files. The women in the horse and buggy - gasoline was not readily available for non-military people - are no doubt feeling pretty good about having any ride at all. If you are curious how Berlin got that way, the video below is a good introduction.